Telangana State Public Service Commission (TSPSC) has released an employment notification for the recruitment of various posts in Telangana state. Candidates may apply in the prescribed format. The job location for this post is Telangana. Interested candidates may apply online through the official website. Before applying for the posts, candidates should register themselves as per the One-Time Registration (OTR) through the official website of TSPSC. 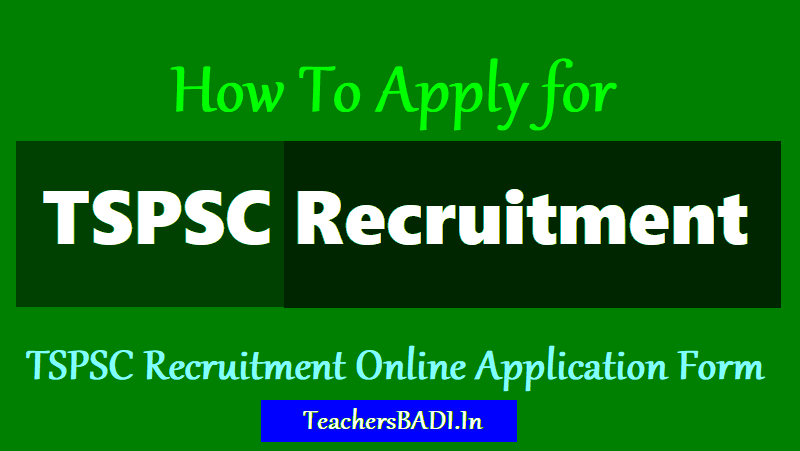 Application fee for TSPSC Recruitment, Selection Process for TSPSC Recruitment, Eligibility for TSPSC Recruitment, Last date to apply for TSPSC Recruitment, How to apply for TSPSC Recruitment and more detials are given here. Online applying procedure for TSPSC Recruitment, How to Upload the TSPSC Application form. Failure to pay the examination fee, application fee, wherever applicable will entail total rejection of application. The list of Banks providing service for the purpose of online remittance of fee is given. Step 1: The Candidate has to visit the WEBSITE http://www.tspsc.gov.in and fill the OTR application if not registered earlier to obtain TSPSC ID. While filling the same, the candidates have to ensure that there are no mistakes in it. The Commission bears no responsibility for the mistakes, if any, made by the candidates. Step 2: The candidates have to visit the website http://www.tspsc.gov.in to submit Application and Click on the Link with Notification Number and Name, provide TSPSC ID and Date of Birth to proceed further. Step 3: Immediately on entering the above details, the applicant will get payment gateway of SBI ePay. The Telangana State Public Service Commission (TSPSC) issued a job notifications inviting applications for about 310 posts in the Tribal Welfare and BC Welfare Departments. Of the total posts that have been notified, 219 were of Hostel Welfare Officers Grade-II in the BC Welfare Department, 87 Hostel Welfare Officers Grade-II and four Hostel Welfare Officers Grade-I in the Tribal Welfare Department. The PSC has advised candidates to visit its website www.tspsc.gov.in for detailed information. Assistant Librarian Posts to be filled in in Director of Medical Education.